We are pleased to announce the publishing of two new books today. The first is BIG BOYS DON’T CRY by Tom Kratman, the well-known military science fiction author. 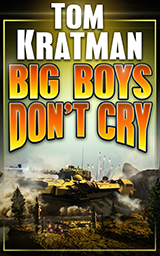 Big Boys Don’t Cry is a novella from military science fiction author Tom Kratman, known for A Desert Called Peace and the Carrera series. The novella follows the life cycle of a Ratha, a sentient future supertank that dutifully fights Man’s battles on dozens of alien worlds. But will the massive creature still be grateful to its creators when it discovers it has a conscience? And how long will an intelligent war machine with enough firepower to flatten a city be content to remain Man’s obedient slave? The second is QUANTUM MORTIS The Programmed Mind by Vox Day. A literary remix of a classic 1968 science fiction novel by Jean and Jeff Sutton, the novel is a tightly plotted, intense spy thriller that lays the deep historical foundation for the futuristic science fiction world of Quantum Mortis. Centuries before Chief Warrant Officer Graven Tower joined MCID, the Greater Terran Ascendancy found itself facing a historic crisis when the Shiva-class cruiser ATSV Rigel went missing during a routine patrol through the Kantillon sector. Fortunately for the great star-spanning Terran empire, the Ascendancy Intelligence Directorate’s top operative, Daniela York is on the scene. But is she capable of penetrating the lethal plot being executed by House Dai Zhan’s ruthless assassins, especially after the Directorate discovers that the cyborgs of the Man-Machine Integration may be involved?